In the cold chill of January, there’s no better way to spend a Saturday afternoon than in a cozy nook at a library. 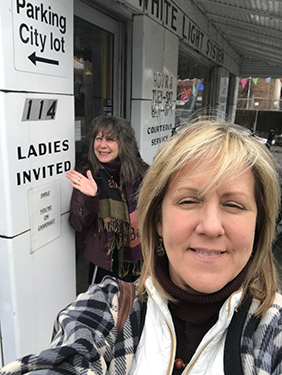 I took a long drive through the spitting snow to meet up with gal pal Rhonda in Frankfort. 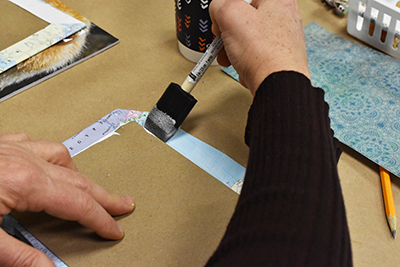 The Kentucky Historical Society was offering a beginners book binding class that looked like an interesting way to spend a winter day. Along with the state capitol building, Frankfort is a town packed with museums and historic points of interest. I must admit I’m not too familiar with Frankfort. I went to the capitol once to protest an oil pipeline that would have come too close to our farm. It worked, by the way – there’s no pipeline! The only other place I’ve visited in Frankfort is Rick’s White Light Diner. It’s a local legend located in an odd little building tucked next to the old bridge. 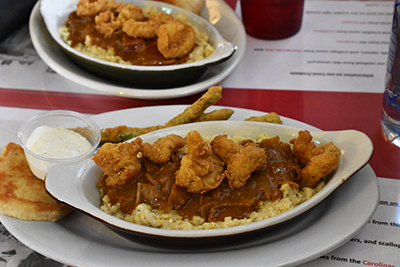 Rick serves traditional Cajun dishes, takes great pride in the quality of his seafood, and isn’t ashamed to charge a hefty price for a Po Boy sandwich. Rick is quite the character and will launch into a heated political debate as soon as you walk in the door. After an interesting lunch with Rick, we sauntered over to the Kentucky Historical Society for a quick look around before our class started. 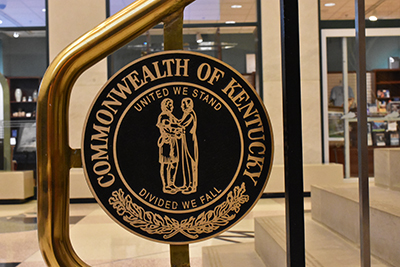 It’s a modern building that houses both a museum and a library of Kentucky artifacts that are used for genealogy and research. 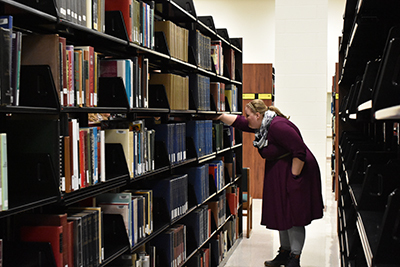 Our class was invited to poke around the library’s archives at the Kentucky Historical Society. 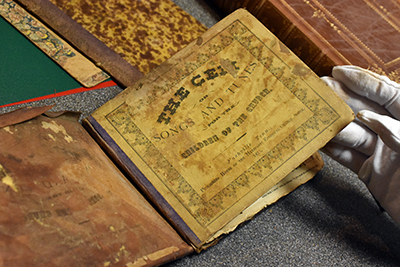 There’s a vast collection of antique books here, and we were asked to look for old methods of book binding as examples for the class. 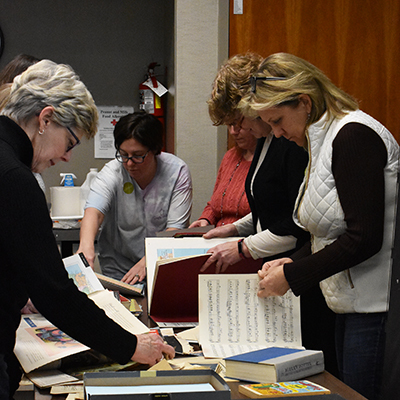 The Head Librarian showed us how her team is responsible for restoring old books in their collection. 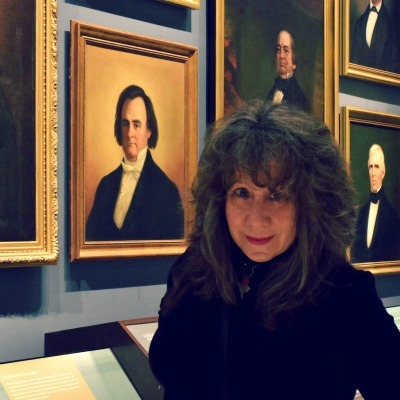 Not only do they need to know library arts, but they also have to be master conservators to preserve the archive. 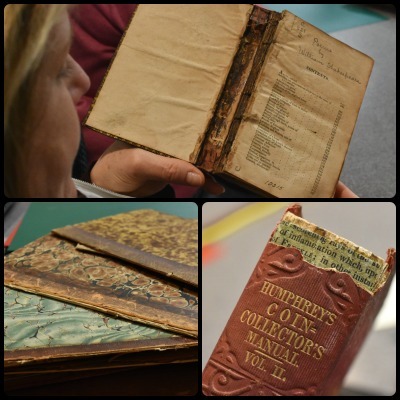 She demonstrated all the tools and methods used to recondition old books. I had no idea there were so many ways to bind a book – ancient, traditional, and modern techniques, each with their own set of tools and skills. I’ve got a new level of respect for librarians now! 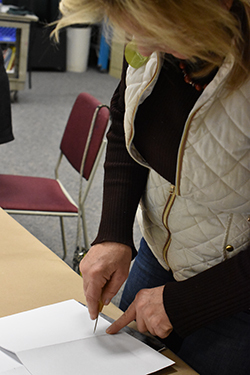 About a dozen ladies signed up for the book binding class. It was well organized and led by a capable instructor who has a passion for the craft. 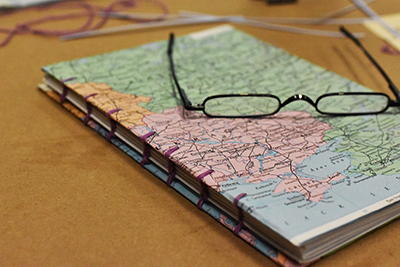 All the supplies needed to bind a book were neatly organized, and we were allowed to create our own book cover design using a variety of materials, like maps, old magazines, and sheet music pages. We learned the Coptic method of book binding, one of the oldest and “simplest” ways. But even this simple method was quite complicated and took a few hours to complete. 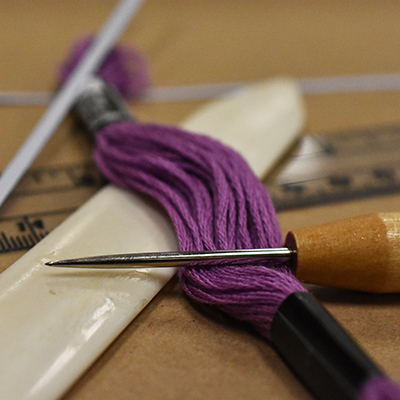 You start with a stack of folded papers called a Signature, carefully line up and punch holes in each set of signatures, then sew it all together with embroidery thread using a series of stitches and knots. If you do it right the finished product is a sturdy bound book that lays flat when opened. My book binding effort turned out a little wobbly. I’d say this is a craft that needs some practice to achieve good results. 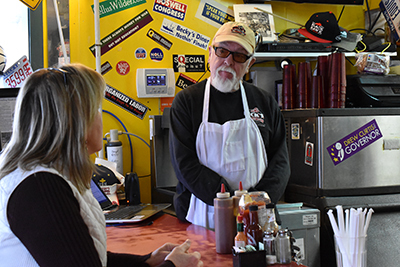 I plan to travel back to Frankfort when the weather warms up – to have another debate at Rick’s Diner over shrimp and grits and explore the rest of Kentucky’s lovely capitol city. Best time I’ve had in a library! Let’s go back! What a fun outing! Teach me when we come! I’ll book a lesson for you – haha!